A decade after the collapse of Lehman Brothers Holdings Inc., life expectancy for a man in Britain, the oldest liberal society in the world, has declined from an anticipated 83 years to 82, and for a woman from 90.1 years to 89. At the same time, life expectancy in the US, considered as the first representative democracy in history, is also falling. At the same time, the median hourly income is about the same as it was in 1971. While this book does not intend to deal directly with the causes of these gloomy facts, the story it tells about how the very wealthy few use authoritative power to manipulate the economy for their own good might give a clue about the declining quality of life for the rest. Johnson, S. (2009). The Quiet Coup. The Atlantic, p. 52. Available: http://www.theatlantic.com/magazine/archive/2009/05/the-quiet-coup/307364/. Accessed 24 January 2012. Krugman, P. (2011, November 4). Oligarchy, American Style. The New York Times. 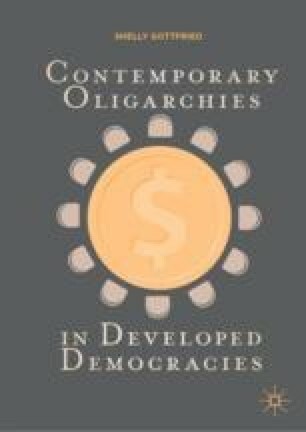 Available: http://www.nytimes.com/2011/11/04/opinion/oligarchy-american-style.html. Accessed 3 November 2012.